Apologies for the last minute New Year's Eve idea... But my NYE plans are pretty last minute as well. As of two days ago, we had no plans so I decided to host a small get together for whoever wanted to ring in 2014 I'm a low key way. Being the Jell-O shot aficionado that I am and being the champagne lover I am, it only seemed right to do some sort of champagne Jell-O shot for New Year's. (Similar to my French 75 shots, but with raspberries and chambord). 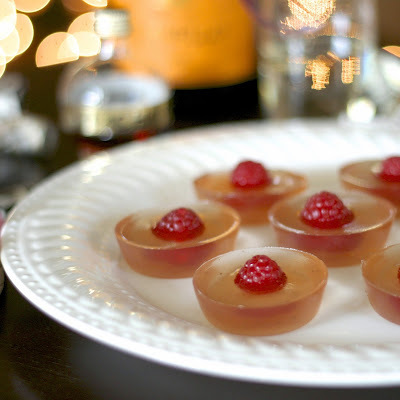 A popular addition to bubbly is adding a dash of raspberry or framboise liqueur, so I decided this would make a fabulous Jell-O shot as well. 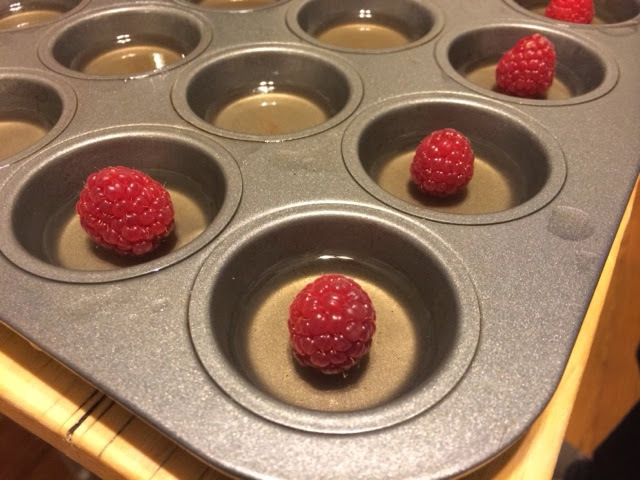 Prepare a mini muffin pan by lightly spraying with cooking spray. Wipe with a paper towel. (This will leave just enough residue to keep shots from sticking). Pour one cup of champagne in a small saucepan. Sprinkle with gelatin and allow to soak in for a couple minutes (without heat). It will look all weird and alien-like. Don't be alarmed. 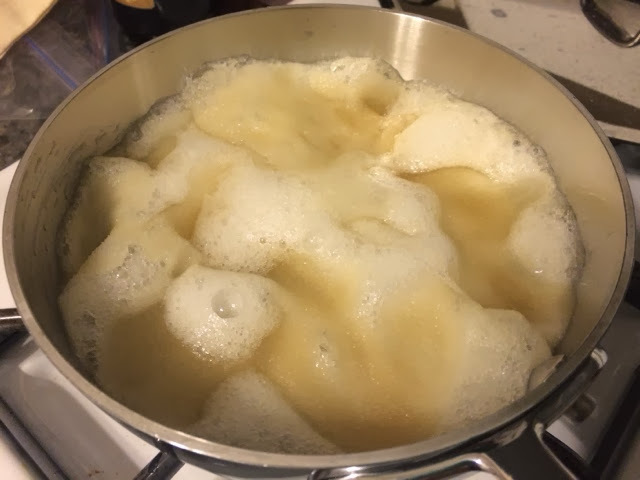 *A note about how much gelatin to use: since my base was all alcohol, I upped the amount of gelatin I normally would use. I'll admit, my shots were a little "chewier" than normal. I think you'd be ok with 2.5 or even 2 packets of gelatin, but I did 3 just to be safe. However, be warned they will be a little chewy, so I'll probably reduce next time. Turn on the heat to medium and warm until gelatin has dissolved, stirring constantly. Add sugar and stir until dissolved. (I used a strawberry sugar, but regular ol' white sugar will work just fine). 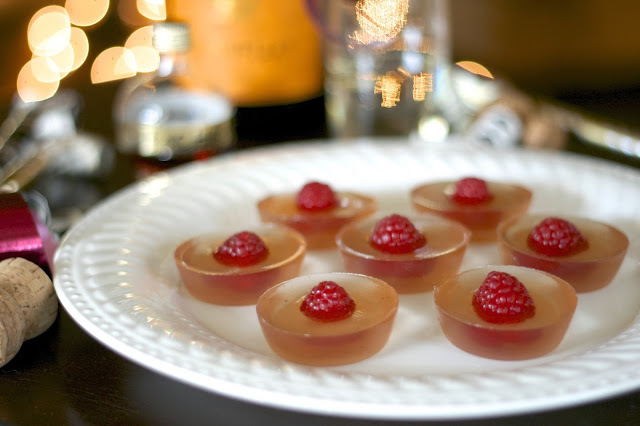 Remove from heat and pour in the remaining 1 3/4 cups of champagne and the raspberry liqueur. Transfer to something with a pour spout (such as a large measuring cup). Fill muffin pan about 1/3 to half full. Place in refrigerator to lightly set, about 15-20 minutes. Remove from fridge and set one raspberry in the middle of each shot. Fill the rest of the way with remaining champagne mixture. Put back in the fridge and allow to set 3-4 hours or overnight. When you're ready to plate, carefully dislodge them from the pan and place on a platter. Hope everyone has a safe and happy New Year and cheers to 2014... it's going to be a great year! Pour one cup of champagne in a small saucepan. Sprinkle with gelatin and allow to soak in for a couple minutes (without heat). Turn on the heat to medium and warm until gelatin has dissolved, stirring constantly. Add sugar and stir until dissolved. When you're ready to plate, carefully dislodge them from the pan and place on a platter.